Get the extra space you need without relocating - build mezzanine flooring! During our decades in the mezzanine flooring and storage industry, we have designed, supplied and built hundreds of industrial mezzanine floors for clients across Kent and London. So why not use our expertise and buying power for your project? Contact us for a free location visit, design and industrial mezzanine flooring quotation. Our dedicated industrial mezzanine flooring team will oversee your project from initial quotation, fabrication and professional mezzanine flooring installation to managing all aspects of building regulation approval. When we undertake any commercial or industrial mezzanine flooring project for a client across Kent, London or the Home Counties, we provide an extensive project management service. From the very beginning of the project, we'll take care of everything for you. We'll start with a no obligation site survey to discover what is possible in your existing set-up and what the optimal mezzanine flooring solution would be. We will then provide a complete design and layout service that also includes full CAD design. This will give you a proposed layout of your new commercial or industrial mezzanine floors. Following this, we will take care of all safety, planning and building regulations to ensure that your new mezzanine flooring correctly conforms to legislation. The final stage will be to have your mezzanine floors installed by our professionally trained and extensively experienced installation teams. As one of Kent and London's leading mezzanine flooring specialists, we will provide you with a raised storage area that fully meets your exact specification; with the consistently high quality of workmanship that we demand. 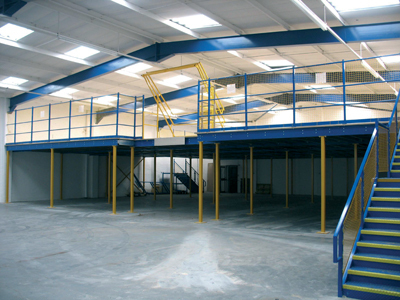 All our industrial mezzanine floors are fully customisable with safety barriers, swing arm pallet gates, handrails, cat ladders, staircases, up and over pallet gates, glazing, powder coated steel sections, partition walling and column casing fitted as required. Should your storage project need it, we can also incorporate single and multi-tier mezzanine floors, with a comprehensive choice of flooring, warehouse lighting and suspended ceilings. Manufactured to your exact specification, guaranteeing high quality, durable mezzanine floors that maximise the space you have available. We specialise in providing clients from across Kent and London with the very best in mezzanine flooring design and installation services. We have recently worked for industrial and commercial clients in Ashford, Rochester, Dartford, Canterbury, Maidstone, Tunbridge Wells, Bromley, Medway, Greenwich, Basildon, Charlton, Kenley, Croydon, Forest Hill and South East London.